1. Preheat the oven to 200°C, gas mark 6. Heat the oil in a frying pan and cook the pepper and onion for 5 minutes until softened. Stir in the canned beans and cayenne and heat through gently. 2. 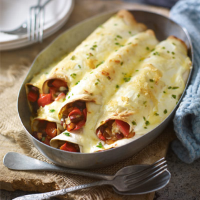 Divide the bean mixture between the tortillas and sprinkle with a little cheese (reserve some for the top) then roll up and lay snugly side by side in a heatproof dish, about 22x30cm. 3. Spoon over the cream and scatter with the green chilli and reserved cheese. Cover the dish with foil and bake for 10 minutes then remove the foil and bake for a further 10 minutes until golden and piping hot. If you would like meat in this recipe, add cooked chicken, chopped bacon, chorizo to the bean mixture or substitute it with chilli con carne. A warming, juicy red would be ideal here: Valdivieso Winemaker Reserva Malbec 2011 Central Valley, Chile.